I've only just realised that I haven't shared one of these posts with you for the last 2 months, whoops! Sorry guys. So I thought I'd better give myself a kick up the bum and show you what I've been loving over the October period. I can't believe it's the 4th of November already! Which means it is only 50 days until Christmas!!! I've decided that I'm grounded until I've done all of my Christmas shopping this year. As I can't stop spending! I wish I could stick to a spending ban. The expert face brush - this is a must have make-up brush in your collection. It makes applying foundation, concealer so easy and leaves you with a flawless finish. The blush brush - this brush gets slated a lot for being too big, but the tapered tip of this brush makes it easy to apply my bronzer/blusher. Both of these are just £9.99 from Boots or Superdrug. I've washed these brushes a million times and they still look and feel as good as new. Woodwinked: I can't get enough of this bronze eyeshadow lately. It has got to be one of my favourite MAC eyeshadows of all time and is perfect for A/W. Charcoal Brown: I've been using this little gem to fill in my brows. Vanilla: gorgeous as an all over lid shade with another eyeshadow blended into the crease. Can also use this under the brow bone and inner corners of the eye to highlight. Nylon: Looks super pretty in the inner corners of your eyes. These eyeshadows are £10.00 each and worth every penny. I really love MAC for their eyeshadows, they are so smooth and blend so easily. I just can't get enough of applying my eye make-up. I never really use to wear it before blogging. Well only on big nights out with the girls, but it seems that I'm wearing it more and more everyday now. Yayyyy! This is my favourite liquid eyeliner at the minute, which has a thick and thin 3D applicator that makes applying your favourite winged eyeliner super easy. You can apply this super thin or twist it to the side to create a thicker line. It feels like you're using a felt tip pretty much. I picked this up in boots the other week for just £5.49. Now it has had a lot of mixed reviews, but mines worked a treat. What have you been loving throughout October? I really really want to try the real techniques brushes!! Everyone seems to love them and I am yet to try them! Ahhhh the RT Blush brush is next on my shopping list! Amazing choice of mac eyeshadows too - woodwinked looks like the ultimate bronze, love it! Really need to get my hands on some MAC makeup.. I actually don't own any.. how bad is that?! I really want to try the real techniques blush brush. 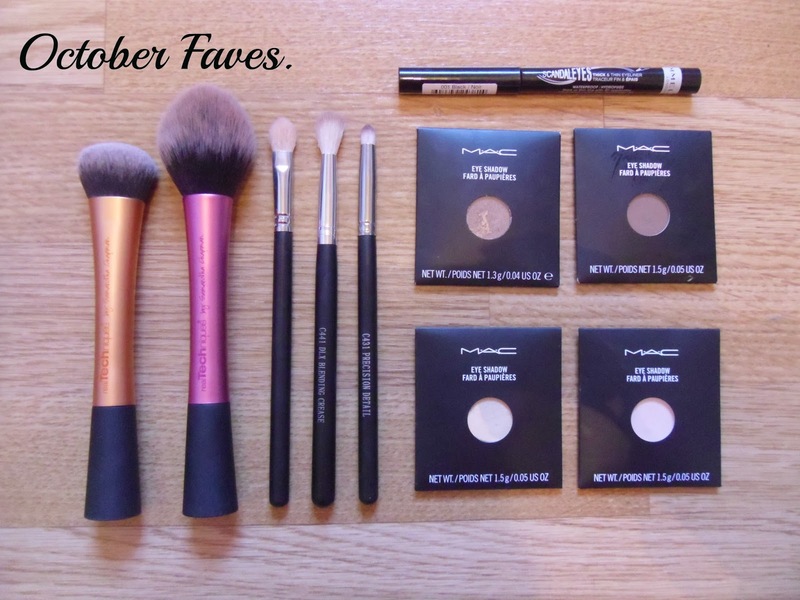 I have the expert face brush and I love it, so i'm dying to try that one too! I want to buy it for power, as it's big (as you said) and considering I have a pea head the powder brush...would drown me. haha. The MAC shades are gorgeous too. I actually really love the Blusher Brush - I would have to say those are my two favourite RT brushes. I should invest into some brushes. Might try the ones that you like. Great selection! I love those brushes! The crown fluff brush is my life haha, I'm wanting to buy back ups because it is that amazing. I bought my first Real Techniques brush a while ago and I cant wait to get the blusher brush. It looks so fluffy!